In Bulgaria we stayed in a small coastal town Obzor. Its proximity with the sea favors to its growth as a tourist town: here and there are built multistorey hotels, which overshadow with their size traditional small houses with orange tiled roofs. 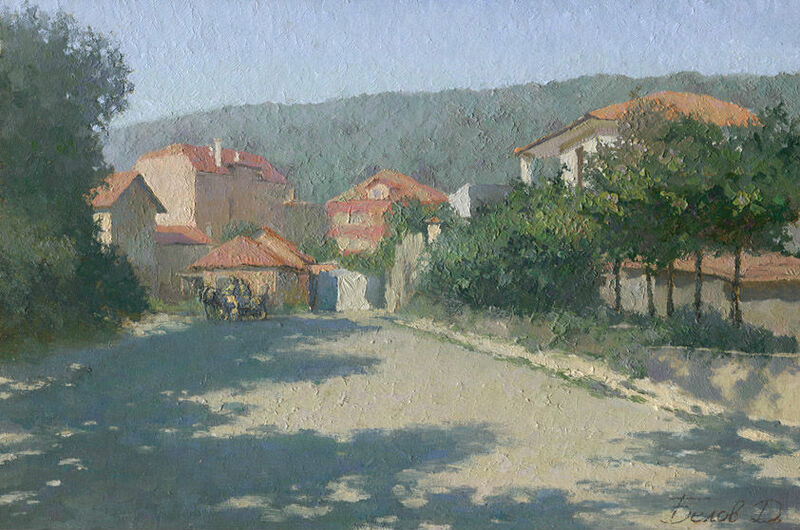 In the morning I, after my tutor’s Daniil Alexeyevich Timoshenko example, settled to paint in one of the old streets. Exactly in the morning as at this time the long shadows fall from the trees on the street and give an opportunity to work for some time, hiding in them from the sunshine. The work on the study prolonged. I began to recognize some of the passersby, who walked from day to day during my sessions on their own business. I also became familiar with them: when some of them came closer to watch the work, they shared their impressions, noting that I have been painting here for several days already. On the third day one nice old man, doddering with the cane and the box of the candies, approached to me and treated me with candy. On the next day a man, who had already asked how the painting is going, walked to me, stayed nearby and gone up the street. Then he jumped over the fence of one of the gardens, climbed out, came back to me and offered me armful of pears.